Under the California Environmental Quality Act (CEQA), public agencies are charged with the duty to avoid or substantially lessen significant environmental impacts of a project where feasible. This process is undertaken through an Environmental Impact Report (EIR), an assessment that identifies any potentially significant impacts of a proposed project on the environment. The EIR indicates the manner in which those significant impacts can be avoided or significantly lessened; identifies any significant and unavoidable adverse impacts that cannot be mitigated; and identifies reasonable and feasible alternatives to the proposed project that would eliminate any significant adverse environmental impacts or reduce the impacts to a less-than significant level. See below for previously approved environmental reviews and any currently underway. In December 2018, the Construction Authority initiated the preparation of a Supplemental Environmental Impact Report (SEIR) to evaluate the environmental impacts associated with proposed Modifications to the existing approved Project (2013 FEIR as addended). Project Modifications include construction and operation of the Project in four construction phases, rather than two phases; incorporating a parking facility design refinement near the Pomona Station (relocating the station parking facility from the north side of the station to the south side) and implementing a new mitigation measure that would widen White Avenue near the La Verne Station (from 1st Street to 6th Street in La Verne). The need for possible phasing is the result of a recently identified funding shortfall for the project, and allows the Construction Authority flexibility to build as far as possible with the available funding. The Draft SEIR was published on March 22, 2019 for a 45-day review and comment period (click here to review the Notice of Availability). The Draft SEIR concluded that one new significant unmitigable traffic impact will occur as a result of the proposed changes to the project, at the intersection of Glendora Avenue/Route 66. All other impacts have been mitigated to less than significant levels. 1) Attend the Public Meeting/Hearing on April 16, 2019 at the La Verne Community Center (click here to get more details). Comments must be received no later than May 6, 2019 to be responded to in the Final SEIR. The Final EIR was published on February 14, 2013. The Final EIR was certified and the project’s Locally Preferred Alternative selected by the Construction Authority board of directors on March 6, 2013. 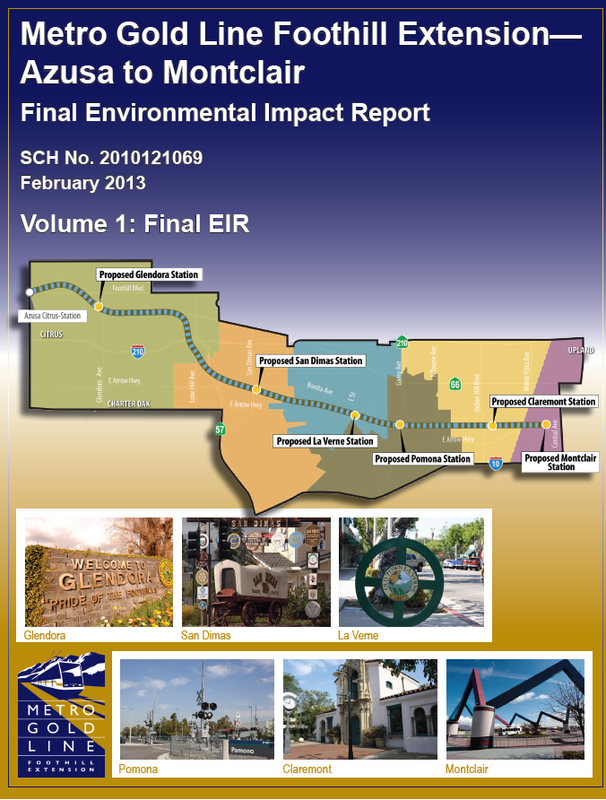 To access the Draft Environmental Impact Report released in 2012, click here. To order a copy of any of these documents, complete a public information request here. To access previously released Environmental Impact Reports please click here.